We are all thrilled with the recent surge in public support for reducing plastic waste and protecting our oceans but there is still a long way to go. Sadly Skomer’s inaccessible beaches are strewn with man-made items, from flip flops, bike wheels and bottles, but the vast majority on this island is rope and buoys from the fishing industry. What at first looks like a lovely Skomer scene of splashy seas around hauled out seals on the rocks by the Garland Stone last September, soon becomes a heartbreaking image when you notice the seal at the back has rope around her neck. Skomer's waters have species and habitats of national and international importance. These include grey seal, pink seafan, sponge communities, eelgrass and algal communities. 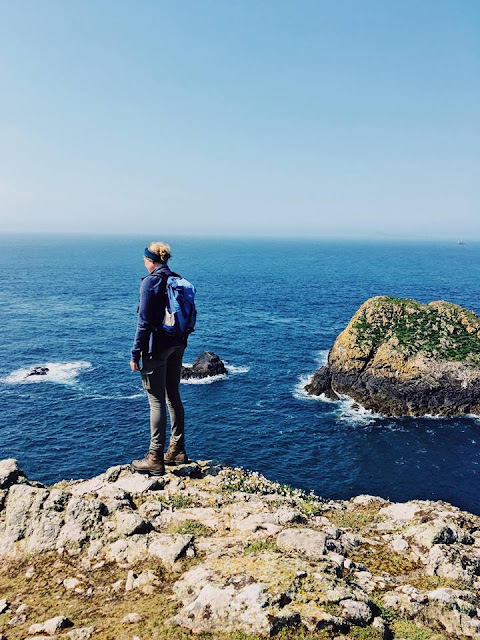 So how are Skomer's waters protected? Skomer sits within a Marine conservation zone, which was the first in wales, established in 2014. Before 2014 the area had been Wales’ only Marine Nature Reserve for 24 years. Skomer MCZ has byelaws which are under nature conservation legislation. These restrict activities such as dumping rubbish and taking, killing or disturbing wildlife.There is a 5-knot speed limit within 100m of the shore to reduce disturbance to wildlife. The Reserve also benefits from specific fishery byelaws, prohibiting the use of mobile fishing gear (dredges and beam trawls) and the taking of certain scallop species by any means. All activities are subject to voluntary codes of conduct in addition to the bylaws mentioned above. Many people are surprised that any type of fishing is permitted around Skomer, and are surprised to see the fishing boats and pot buoys around the island, especially when they appear to be quite close in. However, as we all know. The sea doesn’t have boundaries which separate different areas. Even more so than on the land, the sea has to be looked at as a whole, particularly when marine litter is concerned. The Bike tire that washed up on South Haven beach earlier this year could have floated quite a distance, and we’ve had plastic water and drinks bottles with French and Irish branding. Awareness of how litter on the land ends up in the sea will hopefully begin to change the tide on this, but there is very little discussion or comment on how to tackle the amount of fishing gear which is either discarded into the sea, or lost. A Seal pup at the Wick rests it's head on a piece of plastic, surrounded by bottles, plastic packing tape, a buoy, and other plastic. The Wildlife Trusts have recently launched the Living Seas Campaign. For more information on how to protect the seas, with information on how to chose the fish you eat, and more information on the important species that live there see here or for wales here. To celebrate National Marine Week, we will be conducting sea watches from the Garland Stone either at low tide, or on the days when low tide is in the evenings, you can join us at Skomer Head through the middle of the day for a sea watch? We will also be updating our twitter daily with our seal counts.